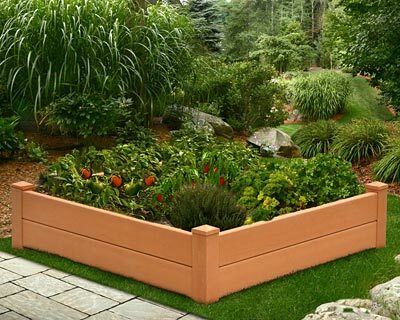 Create an individual garden plot in your backyard using the New England Chelsea Raised Garden Bed. Planting vegetables or flowers in a raised bed provides a unique opportunity to create a garden without tilling soil or redesigning your backyard. The 4' square footprint on this unit offers plenty of growing room, perfect for some flowers or even a sandbox. Its vinyl and recycled wood pulp blend creates a durable and beautiful unit, lending the look of wood to your yard with the easy maintenance of vinyl. This revolutionary material remains a tan color for several seasons, and cleans in moments with a garden hose. The included posts install into soil easily, and the two boards on each side lock into place for a fantastic, 11" deep planting area. Line the interior with landscape fabric (not included) to separate this area from your existing lawn, and fill the unit with healthy soil for optimal plant growth. Turn a section of your yard into a garden oasis with this Chelsea Raised Garden Bed. Assembly required. Ten year warranty.